Editing is the art of manipulating a lot of information and cherry picking only what is needed to make something concise and adding some creativity to make it beautiful. Whether it’s a major corporation or a grassroots, quality is the essence for videos. Because today video is dominating search engines and social media, so if you are compromising with your video quality then it’s gonna affect your ROI. Here are five common video editing mistakes people make – and why it is a good idea to bring in Miami Video Production specialists to avoid them. Uneven audio mixing: This is the common problem many video editors run into. Synchronization between the voice commentary and music soundtracks is sometimes not good which leads to important bits of information being inaudible. If a person has to constantly interfere with their device’s volume settings to hear something, they may simply turn the video off – even if the content was something they really wanted to know about. Sloppy edits: Cutting between two different pieces of media in a video is a fundamental aspect of video editing – doing it the wrong way can send a message that the video is amateur in its construction, which could also give viewers the same idea about the company behind it. Simple edits: If you are using the simple editing techniques that can be found on the free programs, viewers may take notice and it can create bad impact. So rather than using the free programs, you should opt program having nice editing effects. Being too extravagant: Being too extravagant can also backfire. Some businesses are so scared that they invest a lot more into video editing to accommodate every effect possible in a short clip. But the professional know where the sweet spot is between too little and too much in video editing. Video mistakes: Video mistakes can cost you time as well as money. Everyone tries to create a perfect video and there is no harm rather it’s good. But when a company tries to spend too much time on it they take away resources from other areas of their business. Bringing in the professionals is a smart move to create a great video in less time. Regulus Films – #1 Video Production Miami helps you to produce high quality video production in a cost efficient and time efficient manner. Remember, subscribe and give us two thumbs up. Contact Regulus Films–#1 Miami Video Production Company today and don’t let these errors bring your good video concept. Video with capability to engage audience: If your video is dull and if you don’t use video effectively then you will quickly lose your audience. You need a good story to engage the audience.Your video should illustrate how your product/service solves your customer’s problem and it should do so in an engaging fashion. Before choosing a Miami Video Production Company look at their previous work and if it seems not engaging, yours video won’t be either. Video should convey clear message: The video should not contain much about you because no one cares about you, they only care about how you will solve their problem. Deliver the strong and concise message as per the audience need. What audience will be benefited from your video? What problem our product/service solve? What will be the benefits of our product/service? Video should be creative: The video should be creative so that it could even go viral, making your brand an instant sensation. To get the best results, you have to let your creative juices flow freely as this is the only way to make your video stand out. Video should contain Call to Action: Ask yourself what do you want people to do after watching your video? If you don’t know, your viewers won’t either. The “call to action” is one of the most important component for any kind of marketing because the ultimate aim of the video is to grab the peoples’ attention. So adding a call to action in your video is a must. Contact Regulus Films for any kind of video production in Miami. Call us today at 786-429-4511 and leverage the best Miami video production experience. Whenever you ask a miami video production company to create a video, you likely have marketing in your mind. Right approach is required to promote a product, an event, a special cause. But even the videos that look awesome and provide a lot of information are often missing one key component “call to action”. The “call to action” is one of the most important component for any kind of marketing because the ultimate aim of the video is to grab the peoples’ attention. Understanding why a video needs a CTA, how it can be used, and where to place it are all important points for miami video production companies to acquire if they want their videos to be as successful as possible.Without the call to action, the video may be simply forgotten, but an engaging video can direct people on what to do next. The call to actions are so important that they can help persuade a person to reach out and make a purchase. Regulus Films – Miami video production company may recommend peppering the call to action throughout the video at various points. It can be displayed consistently as a line of text on the screen, it can be added as an intermittent caption, or it can even be spoken at various points through the presentation.The call to action could be a clever annotation, placed on screen so the presenter can point to it for a unique effect. It could be a formal caption with links and phone numbers added at the final frames. No matter how it’s being used, having a good call to action is key to success for any video. Being #1 Miami Video Production Company – Regulus Films communicate effectively to produce high quality Miami video production with unique call to actions in the videos. Contact us today at 786-429-4511 for any video production in Miami. Of course, not all Miami video production companies are equal. Regulus Films offers complete video production solutions with a wide range of production services and the ability to seamlessly move from concept to creation. Having over 2 decades of experience in video production and interactive media, we’ll work with you to create the most captivating campaigns and promotions possible for your business. In short, we are #1 video production Miami Company. Video Quality: Quality is absolutely essential and sub-par video quality won’t impress your audience, so as a #1 Miami video production company our prime focus is on the quality of the video as it represents your business to your potential customers. Our video are appealing enough to grab customer’s attention and leave a strong impact that pushes them toward the desired result. Overall Video Cost: Of course, your budget plays an important role in video production. Because you always want high-quality and effective video production without spending more than what you can afford. 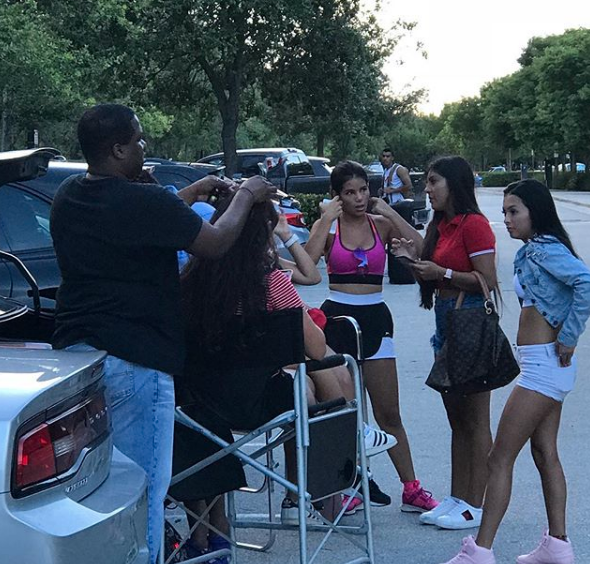 But at Regulus Films, we welcome all the budgets and deliver real results to match your budget without sacrificing on the effectiveness and quality you’re looking for Miami video production. Turnaround Time: After you’ve narrowed down your options and found a company to fit your budget, make sure you choose a team that can meet your deadlines. It’s usually a good idea for you and the video production team to have access to notes and approvals and receive updates as the project advances so you can approve it every step of the way. Our 20 years of experience in the industry and our commitment to high-quality and captivating video makes us the best choice for Miami video production. Want to learn more? Contact us today at 786-429-4511 for any music video production in Miami.